The DSS4450 works in association with the 4412D+ and 4424D+ telephones, each of which can support up to two DSS4450 adjuncts. Auxiliary power is required. 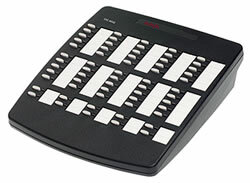 Each DSS4450 provides an additional 60 programmable call appearance/feature keys with twin lamps. No more than two DSS4450 adjuncts are supported per IP Office module. That applies to the IP403 and Small Office Edition control units with DS ports and to the Digital Station 16 and Digital Station 30 Expansion Modules. Click here for a larger view of the DSS4450.